When Alba Ashby, the youngest Ph.D. student at Cambridge University, suffers the Worst Event of Her Life, she finds herself at the door of 11 Hope Street. There, a beautiful older woman named Peggy invites Alba to stay on the house’s unusual conditions: she’ll have ninety-nine nights, and no more, to turn her life around. Once inside, Alba discovers that 11 Hope Street is no ordinary house. Past residents include Virginia Woolf, Dorothy Parker, and Agatha Christie, who all stayed there at hopeless times in their lives and who still hang around—quite literally—in talking portraits on the walls. With their help Alba begins to piece her life back together and embarks on a journey that may save her life. 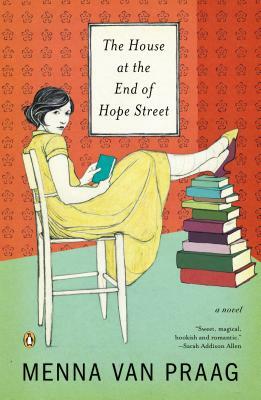 Filled with a colorful, unforgettable cast of literary figures, The House at the End of Hope Street is a wholly imaginative novel of feminine wisdom and second chances, with just the right dash of magic. Menna van Praag is a freelance writer, a journalist, and an Oxford graduate. She lives in Cambridge, England, with her husband and son.